One of the most elegant, timeless styles is three stone engagement rings, which are not only lovely to look at but also have a beautiful sentiment behind the style. 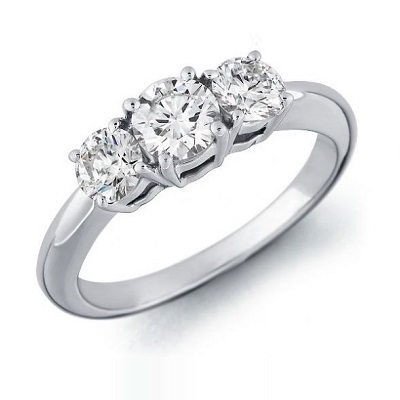 Often featuring one larger stone in the middle, which is flanked by two smaller stones on either side, this ring is said to symbolise the past, present and future of your relationship. The three stone ring ranges from traditional styles that incorporate round cut diamonds in a simple band, to modern styles that could be minimal (fine band, small stones), vintage (pave band, halo stones) or even bold (coloured stones, dramatic settings). However you choose to incorporate the three stones style into your ring, this style is versatile enough to suit just about anyone. To show you how lovely this style can be, we have put together some of our favourite examples of triple stone engagement rings. 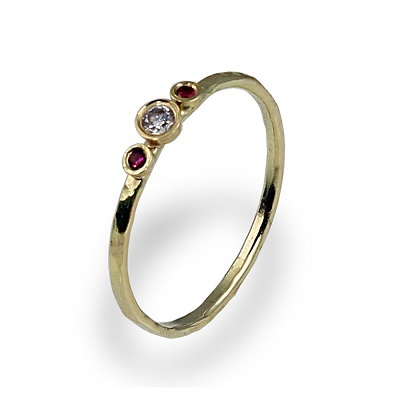 The classic, traditional version of this ring keeps the focus on the stones themselves. Diamonds are carefully set, with the middle stone either a bit larger or set a bit higher than the smaller stones on either side. The band is typically kept plain, which gives the ring a minimal, chic look that is both understated and feminine. 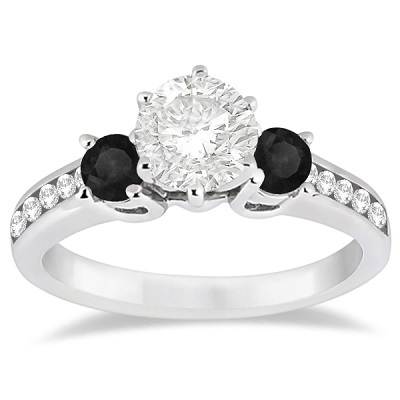 If you are more of a traditionalist who values simplicity above glitz, this style is sure to be the perfect choice. While it looks good in platinum, it also works well in rose gold, white gold and yellow gold. Another elegant style that takes an old fashioned classic and gives it a fresh twist is the mixed stones style. By combining precious stones such as sapphires with diamonds, you will draw attention to the three stones while adding lots of impact. A delicate pave setting that twined around the focus stones adds lots of sparkle without overpowering the sapphires, while a slightly twisted band adds detail. You could choose your birthstone or something that catches your eye – sapphire, ruby, emerald tanzanite, opal or even a coloured diamond could all work well! Two tone rings are another trend that continues to be seen on rings. In this example, a soft gold has been used for the band, with platinum used for the setting. What makes this style work so well is that the setting has been kept simple, with focus on the stones. Adding too much detail to a two tone ring can overpower the balance. But a simple design looks especially gorgeous with mixed metals. You could also try something similar in rose gold, using yellow gold as contrast or platinum. 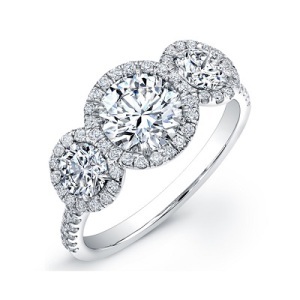 Halo styles have a round stone that is surrounded by tiny stones. 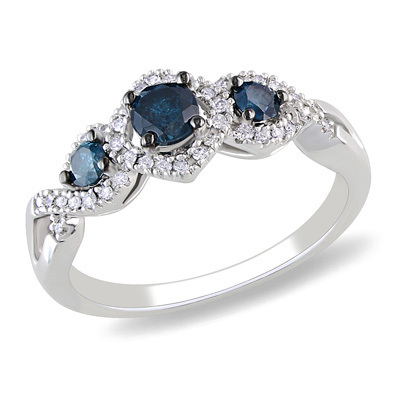 For the triple stone style, the result is a bold, vintage style ring that is glamorous and eye catching. You can take this look even further with a pave encrusted band, or you could keep it a bit more understated with a plain band. Whatever your choice of metals, and whether you opt for all diamonds for the halo or you decide to mix your stones, this style is a classic. You could also highlight the centre stone with contrasting stones. Black diamonds offer a contemporary, stylish look that works well with cool toned metals as well as warmer tones. Paired with a platinum band (pave or plain), this example is simple and yet mesmerising in its contrasts. You could try something similar with coloured stones and a gold band for an equally unique look, or experiment with settings to arrange the contrasting stones dramatically. You don’t even have to be limited to following traditional lines with your ring. Flowing lines add detail subtly, which is enhanced by the addition of pave stones set into the band. 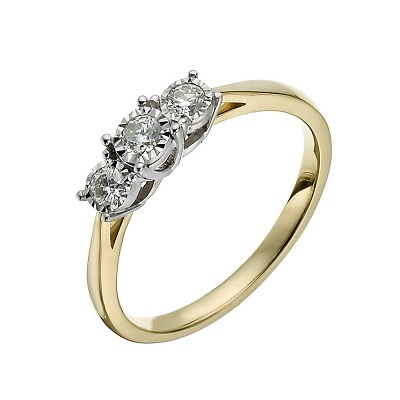 The three stones are then balanced by the lines of the ring, without overpowering or fading into the background. 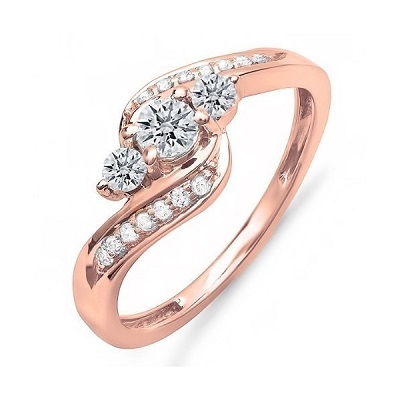 This design looks especially lovely in rose gold, but would work just as well in platinum or yellow gold. You could add coloured stones for the pave or choose precious stones for the centre to add even more detail. If you prefer your jewellery small and subtle, you could even opt for a minimal engagement ring that has teeny tiny stones set into a fine band. Choose a classic platinum or gold band with diamonds, replace the centre or flanking stones with a precious stone such as ruby, sapphire or tanzanite, or try a modern rose gold band with a romantic stone such as morganite for something different. We hope that you are inspired by these examples of beautiful three stone rings. And remember, for any queries or requests on custom engagement rings, we are always happy to help make your dream ring turn into a reality.